What is fiber, why is it good for you, and how can we ensure we're eating a high-fiber diet? Here, you'll find the answers to those questions and more. Among the foods that help you keep a high-fiber diet are fruits, vegetables, lentils, and oatmeal. What is fiber? It’s a substance—technically, non-digestible carbohydrates and lignin—found in plants. The goal is to get enough fiber without going overboard; as with all goods things, too much can be bad for you. The Academy of Nutrition and Dietetics states that we should consume adequate amounts of dietary fiber from a variety of plant foods, but the majority of Americans are consuming drastically less fiber than is healthy. Fiber consumption varies widely from state to state: Californians fare best, but still only 13 percent are eating adequate amounts of fiber; people from North Carolina fare the worst, with only 4 percent hitting the target. The Food and Nutrition Board recommends that adults 50 years and younger should eat 38 grams of fiber each day for men and 25 grams for women. Men and women over 50 should eat 30 and 21 grams per day, respectively. Children should eat less—a 5-year-old around 15g and a 10-year-old around 20g. Too much fiber, besides potentially causing abdominal discomfort, gas, and bloating, may cause nutritional deficiencies, as it can reduce the absorption of vitamins and minerals (calcium, magnesium, iron, and zinc). Follow the guidelines in this post, and if you have a chronic bowel disease, discuss your fiber intake with your physician. Research shows that eating enough fiber can have a protective effect against heart disease, diabetes, high cholesterol, obesity, some cancers (breast and colon), arthritis, and digestive health (e.g., it reduces constipation and hemorrhoids). Adequate fiber prevents the gut bacteria from feasting on the protective mucous in the gut and may even reduce the risk of leaky gut and inflammatory bowel diseases such as ulcerative colitis. They also explain that a healthy microbiome can extract more nutrients from fibrous foods, notably vitamins and fatty acids. Cholesterol: Water-soluble dietary fiber decreases the absorption of fat from food and helps increase excretion of cholesterol in bile. The result: lower cholesterol, and a lower risk of coronary artery disease, peripheral artery disease, and stroke. One type of fiber, pectin, is particularly helpful in reducing cholesterol. Pectin is found in high-fiber fruits like pears, apples, plums, and oranges. Cancer: Fiber reduces cancer risk, but the mechanism is not well-understood. 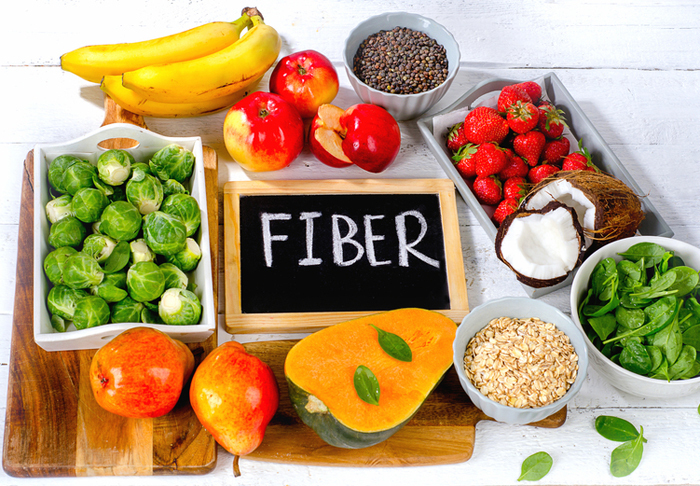 One connection is thought to be that fiber helps remove toxins from the gut and body in general and reduces inflammation. Weight loss and diabetes: Fiber has no calories (because you don’t digest it) and yet it creates a full feeling in the stomach. Added to that, you have to work hard to chew high fiber foods, and when you do, signals sent to your brain tell you that you have eaten and will be satiated soon. Greater consumption of fiber creates a lower glycemic load, meaning that your blood sugar levels are more stable, ultimately improving insulin sensitivity. In turn, this reduces the risk of obesity and helps prevent and reduce the impact of type 2 diabetes. There are two types of fiber in food, soluble and insoluble, and we need both. Soluble fiber attracts water into your gut and slows digestion, allowing time to absorb vitamins and minerals from food, thus reducing inflammation. It can also help reduce blood cholesterol and bulk out your stools, reducing constipation and making a bowel movement easier. Good sources of soluble fiber include oats, barley, fruit (like bananas and apples), root vegetables (like carrots and potatoes), and golden linseed. Insoluble fiber, also known as roughage, does not draw water into the gut; instead it passes through quickly without being digested and speeds the process. Avoid too much insoluble fiber if you have diarrhea. Good sources of insoluble fiber include wholemeal bread, cereals, bran, nuts, and seeds. 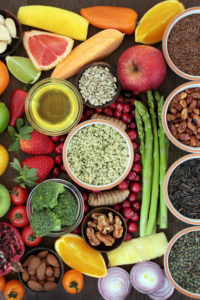 To find out whether your favorite foods are high in fiber, visit the U.S. Department of Agriculture National Nutrient Database. To learn more about The 2015-2020 Dietary Guidelines for Americans, visit health.gov. If you’re currently not eating enough fiber, increase your intake slowly, so that your bowels have time to adapt—otherwise you may end up with flatulence, bloating, and stomach cramps. Make sure you drink more water, too—a total of six to eight 8-ounce glasses per day, at least). You may need to experiment to find the foods that you can best tolerate. To get the most benefit from fiber, aim to eat a variety of different fiber-containing foods. If you’re suffering from constipation, you may want to take a fiber supplement in the short term. These come in tablet, powder, or liquid form. Fiber supplements tend to be purified fibers or functional fibers, not complete foods. Examples include inulin (Fibre Choice), methylcellulose (Citrucel with Smart Fibre), psyllium or ispaghula (Metamucil), and wheat dextrin (Benefiber). Fiber supplements may interfere with some medications, so check with your pharmacist and do not take within an hour of medication. In the long term it is much better to get your fiber from real food, because of the complex relationship between fiber, gut health, and the microbiome, as described in our post. 2 diabetes, artery disease, arthritis, bacteria, bloating, blood cholesterol, blood sugar, blood sugar levels, bowel cancer symptoms, bowel disease, bowel movement, brain, calcium, calories, cancer, cancer risk, cancer symptoms, cancers, carrots, children, cholesterol, cholesterol levels, colon cancer, constipation, coronary, coronary artery disease, cramps, diabetes, diarrhea, diet, dietary guidelines, dietary guidelines for americans, digestion, digestive, digestive health, digestive tract, diverticulosis, fiber, food, food and nutrition, glycemic load, gut bacteria, gut health, health, healthy eating, heart disease, Hemorrhoids, high cholesterol, high fiber diet, ibs, ibs, inflammation, inflammatory bowel, insulin, iron, leaky gut, lower cholesterol, magnesium, nutrients, nutrition, nutrition facts, nutritional deficiencies, nuts, obesity, peripheral artery disease, potatoes, protein, quinoa, quinoa nutrition facts, reducing cholesterol, report, skin, stomach cramps, stroke, sugar, sugar levels, supplement, supplements, toxins, type 2 diabetes, ulcerative colitis, vegetables, vitamins, vitamins and minerals, whole wheat, zinc.